How Do Angel Cards Work? You are here: Home / Other Reading / Angel Card Readings / How Do Angel Cards Work? Obviously, Angel Cards are different from Tarot cards. In some aspects, the angelic symbols are easier to read than those of the ancient Tarot. Generally speaking, the two kinds of playing cards can act as the effective guide offering solutions to numerous life courses. Nevertheless, the Angel Cards have no negativity, no fear, and no reversed side. Hence, consulting Angel Card reading is extremely fun, informative, and positive! Tons of caring, loving, and stimulating messages from the spiritual forces will be interpreted with the high responsibility for good karma. 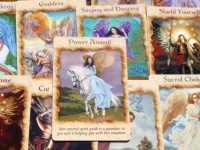 As the wonderful tool for psychic divination, the Angel Cards help to clarify every aspect of life since the God’s servant can sense what is going on in the earth with compassion. They usually want to secure our peace of mind with the sacred boundary, but the concept of free will somehow prevents the Angels from interfering in our life. Hence, we have to call them upon to receive relief, vitality, and enlightenment during the angelic consultation. Basically, the two kinds of card reading have the similar principle: the Psychic shuffles a deck of card, draws them out due to the specific Spreads, and interprets the spiritual messages or guidance on solving the seekers’ problems. However, the source of messages is different. Notice that the Tarot card readers gain information from the Spiritual Guides, Angels, and Guardians via their sixth sense! Somewhat differently, the Angel Card readers specifically receive guidance from your Angels only. As already mentioned, Angel card readings are conducted without reading the reversed side. Hence, they are more uplifting and positive than the typical Tarot Card Readings. What do your Angels let you know today? Always remember that the Angels are most likely to tell you what you need to hear rather than what you yourself want to hear! Hence, be open-minded to accept the occult words! Instead of getting irritated, be judicious to ask the Psychic readers some effective ways to handle the cases in the slightest manner! It can be said that Angel Cards are the epitome of positivity when it comes to occult world and Card readings. They are revealing, yet comforting with no negativity. Thus, some seekers tend to look at them as the opposite of Tarot cards that reveal both the ups and downs. In some cases, consulting the ancient Tarot brings both positive and negative outcomes on the whole. Luckily, after experiencing Angel cards, you will feel refreshed and empowered with the strongly spiritual energy. In the will of God, the Angels will never frighten or steal power of anyone else. First of all, the compassionate Psychics will ask the Angels to bless their cards via the mind connection. The angelic communication is established from the beginning of the spiritual session. The readers won’t forget to ask you to clear your mind with the relaxing mood. Then, it goes on arranging the cards over the surface. Some readers may prefer to work with the pre-defined spreads while others will begin laying out the cards in front of the seekers’ eyes. After that, they will study the cards’ messages. Since each Angel card is associated with multiple interpretations, the card readers will need the angelic connection to pick up the most exact one that perfectly relates to the seeker’s queries. Sacredly, the thrown-out cards are regarded as the special ones chosen by the Angels. At the end of the session, the Psychics will thank the Angels for their support. The deck later is stored in the special spot that is airy, bright or surrounded by Angel status to honor the means of communication. Don’t be hesitant to leave all of your intricacies referring the title “How Do Angel Cards Work?” in the form below for the immediate replies. Who Is Doreen Virtue Angel Card Reading? What Do Angel Card Readings Tell You? i want to know about my future please?